House Democrats are making moves behind the scenes with lawyers on Monday to evaluate their legal options for subpoenaing interpreters who attended President Trump’s meeting with Russian President Vladimir Putin. To hell with the interpreter’s professional ethics, executive privilege or government rules, right, Democrats? On Saturday night the Washington Post released a garbage story claiming President Trump did not tell every little detail of his meeting with Vladimir Putin in Finland. So now the House Dems are going to waste time and resources investigating the interpreter and the meeting. Last year House Democrats tried to subpoena Trump’s interpreter after his meeting with Putin, but the House Republicans shot them down. Vladimir Putin’s mouthpiece, Adam Schiff (D-CA), questioned President Trump’s loyalty to America on Sunday morning and floated the idea of subpoenaing Trump’s interpreters. It’s not just the Republicans who are pushing against this insanity — many in the Democratic caucus have argued against subpoenaing Trump’s interpreters as well because it could make it more difficult for presidents to have face-to-face interviews with foreign leaders which could ultimately harm diplomacy. Interpreters also have high security clearances and many argue that the President’s executive privilege extends to the interpreter as well. If Congressional Democrats send a subpoena to the State Department, the White House can block the request. The mentally deranged Democrats suffering from Trump Derangement Syndrome are marching right ahead though. ABC News reported that House Foreign Affairs Chairman Eliot Engel (D-NY) announced that he’s forming a separate investigative subcommittee to investigate Trump’s interactions with Putin. Trump’s bizarre relationship with Putin? The only people who have an unhealthy and bizarre obsession with Vladimir Putin are the Democrats and their stenographers in the media. 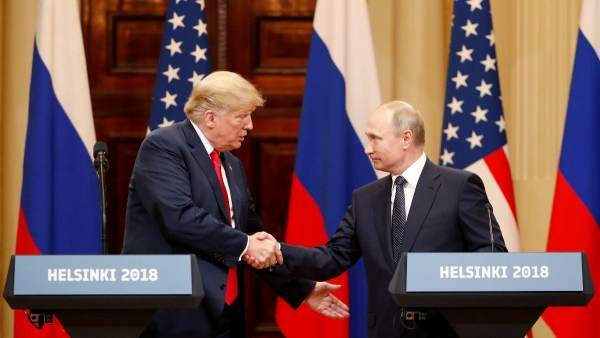 The post Democrats Move to Subpoena Trump’s Interpreters Who Were Present in Trump’s Meeting with Vladimir Putin appeared first on The Gateway Pundit.